PROFS will host a forum to discuss Governor Scott Walker’s 2017-19 state budget proposal at noon, Thursday, March 16 in Room 5120 Grainger Hall. This event is free and open to the public and refreshments will be served. Assembly Majority Leader Jim Steineke (R-Kaukauna), Ben Miller, Assistant Vice Chancellor for Government Affairs and Strategic Partnerships, and Jack O’Meara, PROFS Legislative Representative, will share their expertise and take questions from members of the audience. A recording of the the forum will be available online at a later date. What types of performance metrics are likely to be included as part of possible increased funding for UW System? What is the likelihood of a pay plan for UW faculty and staff? Is a pay plan still possible if the Joint Finance Committee does not approve self-insurance? Would new statutory language codifying the state’s commitment to academic freedom result in any changes to existing campus policies? Are non-fiscal policy items likely to remain in the budget proposal? 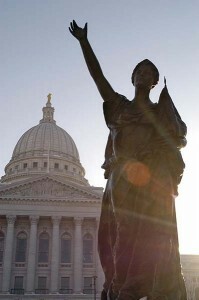 The Legislative Fiscal Bureau summary of the University of Wisconsin System portion of the governor’s budget is here. PROFS is planning a forum on self-insurance later this spring.